Cardiac glycoside toxicity is caused by consumption of cardiac glycoside-containing plants. These include 11 different plant families which include Apocynaceae, Asclepiadaceae, Celastraceae, Brassicaceae Lilaceae, Moraceae, Fabaceae, Ranunculaceae, Scrophulariaceae, Sterculiaceae, and Tiliaceae. Within the 11 plant families, there are a handful of plants that are most likely to be the cause of poisoning in horses. Since oleander poisoning is one of the most frequent causes of plant poisoning in animals, it is also discussed separately. 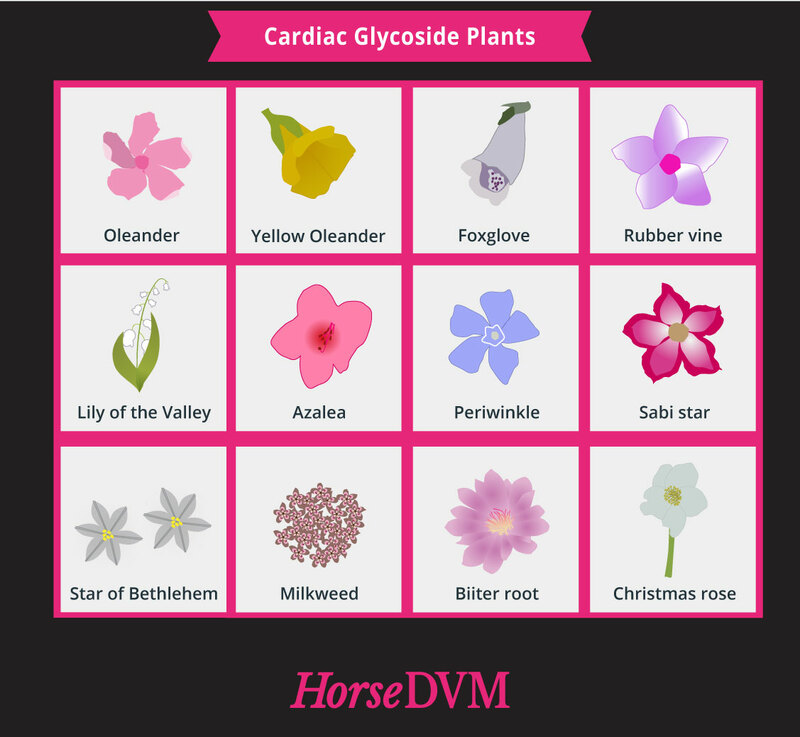 Upon ingestion of cardiac glycoside-containing plant parts, horses may either be found dead or develop primarily heart and digestive disturbances just prior to death. A variety of cardiac arrhythmias and heart block, including ventricular tachycardia and first- and second-degree heart block, may be encountered with cardiac glycoside poisoning. Colic and diarrhea may also be seen in horses poisoned with cardiac glycosides. The duration of clinical signs will usually not exceed 24 hours before death occurs. Fallen leaves or clippings should not be placed near horse paddocks. Poor. Horses that survive cardiac glycoside poisoning may be left with permanent heart damage. Milkweed Poisoning of Horses NM State University.